If you follow me on IG than you may recall this new series I'm bringing to the blog where I review products that YOU want to learn about. This is a new series for 2018 so the first product(s) I'm reviewing are two that I've personally wanted to try out. I'm also going to share a little bit about my skin and skincare routine, too. So here we go! So I'm sure if you follow lots of bloggers than you've seen lots of Tula. It's a pretty popular brand amongst bloggers and for good reason! I started using the cleanser about a month ago and have enjoyed it so far. I really like the scent and formula, basically I love how "sudsy" it gets. Being that I have overly sensitive skin, I've used lots of all natural products but also products like Cetaphil. While I love Cetaphil, I cannot get past the part that there are no bubbles. 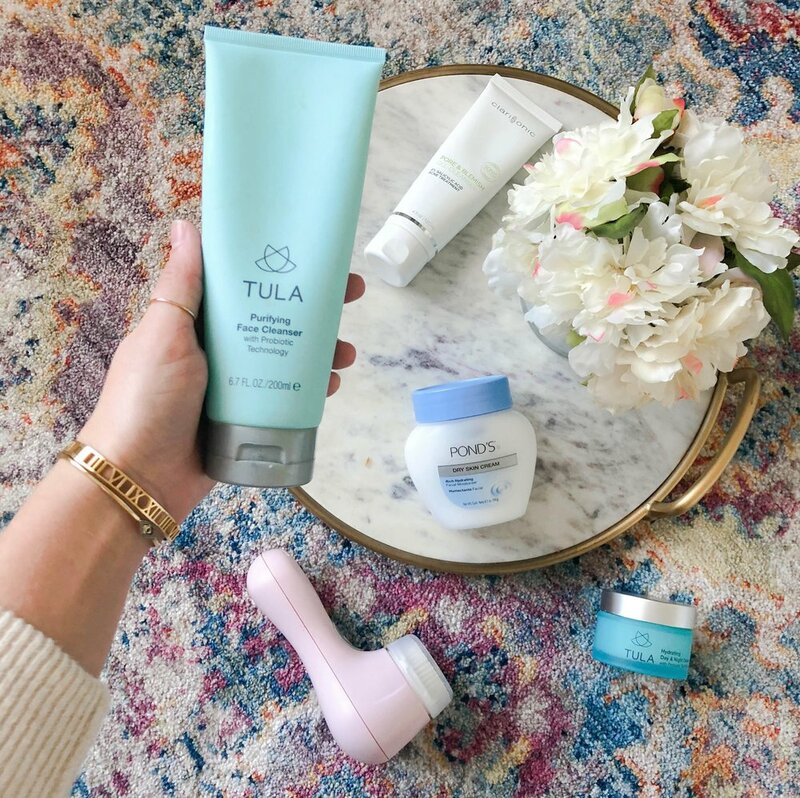 With this Tula cleanser, I really feel like it does a good job at removing all the dirt and make-up on my skin after a day's wear. As for clearing up my skin, it hasn't really done that. I still have breakouts but as far as working with my sensitive skin, I really like it. One thing I will say though is that I've never had a facial. So one of my tasks for 2018 is to take better care of my skin, beginning with getting a facial. I personally believe that 26+ years of not having one is probably just making it worse. So once I get one, I'll share my thoughts + results with y'all. No bad things to say about this product! It does a great job at keeping my skin moist. I use it prior to applying my make-up, too. It is about $50+ for a jar, so I'd say if you're on the fence about trying it out get the Discovery Kit. It's smaller sizes of the best sellers from Tula! That way your investment to try 4 products is just $52 and you can decide which products you like best before buying full size. I will say, during the colder weather my skin gets pretty dry. So I've been using the Tula cream in the morning and then I use the Pond's cream at night. It's a thicker cream that keeps my skin just a bit more moisturized. I've talked about my Clarisonic here, and I still do use this in the shower but only about once a week. I found that the more I used it the more I was breaking out, even with the different types of sonic cleansing heads. I do however love the Clarisonic cleanser! I will typically use the cleanser in the shower regardless of if I'm using my Clarisonic that day or not. It has a tingling sensation that I just love and feel like it gets deep into my pores! So let me know if you also use any of the products that I use or mentioned above. And if you have any other products you'd like to me to test out for the product review series, just let me know! Have a happy Thursday!